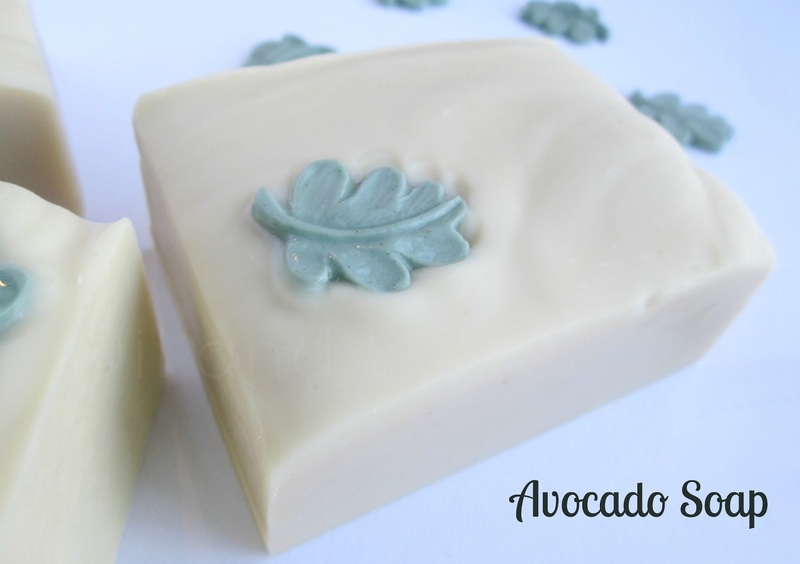 I’ve long wanted to try using avocado in soap but I wasn’t quite sure how to approach it, so I was very happy to see a recipe and instructions for Avocado Moisturizing Bars in the new Soap Crafting book. According to the book, avocados are beneficial for dry, itchy and maturing skin. They are high in vitamins A, D, and E and also contain high levels of lecithin, potassium, protein and amino acids. This recipe utilizes both avocado puree and avocado oil, so it should result in a rich, moisturizing bar! Amy Warden from Great Cakes Soapworks had posted about this recipe a couple of weeks ago on her blog, so I found it very helpful to read her blog post and tips again before I dove in. I also wanted to incorporate aloe vera juice and coconut water, but wasn't quite sure how to do that. By a total coincidence, Denise from Neecy's Necessities just happened to blog yesterday about using different milks and liquids in soap, including aloe vera juice and coconut water, so that was super informative and helpful too! Very interesting Cee! This soap sounds wonderful for winter skin and is quite beautiful with the leaf embedded in the pure white base. Well done! Is it unscented? Thanks Deirdre! I did try a new fragrance in this one, it's a soft complex fragrance that is still fresh and natural at the same time...it goes quite nice with this soap, I love it so far! Lovely Cee! 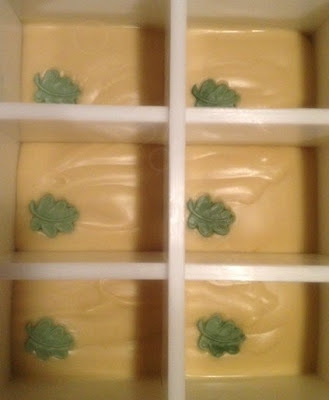 I made the avocado soap this week too, first time I have ever put any of my batches in the freezer. It turned out really nice, and pretty easy. Probably will be a repeat for me! Hey - great minds think alike! ;) I think I'm going to really love the richness of this one...tell me, did you end up with any brown flecks at all? No, none. I noticed your puree was speckled, mine wasn't, might've just been the difference in our avocados :)I don't see any speckles in your soap..? Yes, I'm thinking I didn't stickblend it quite enough. If you look close, there are a few flecks in the soap. I'm going to give it another try and see if I can't get it smoother next time! My honey blended my avocado for me, and he kept rushing me "before it starts to turn brown," hehe. Apparently they are like apples and bananas in that respect? I don't know, never really cooked with them before. Those are so cute, they must be very sensitive for skin! I like colours that way. That's beautiful Cee! I wasn't expecting the end result to come out white like that, not with avocado in it. I love the colouring and the leaf embeds are adorable! The contrast in colours is wonderful, and much as I don't want to jump ahead, the colouring evokes a quiet winter's day to me. I wouldn´t have either expected the soap to bee white. In Finland you can buy this organic avocado oil that is dark green, but it discolors the soap a bit. I would like to try avocado in soap too, but I´m still waiting for "The Book" to arrive. These avocado soaps would make a great Chirstmas present. very pretty Cee! i love how simple it is plus I always love a good embed!!! Cant wait to try avocado soap soon, thanks for all your pointers, they will be helpful. 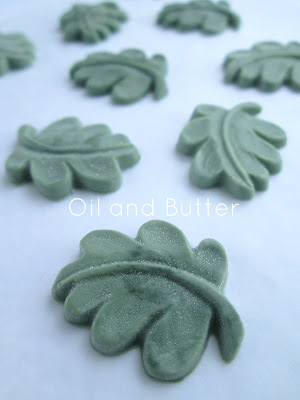 I love the leaf on the soap, super cute addition that dresses it up so nicely. It turned out really nice, this embed provides sophisticated elegance! The soap turned out a really lovely color! I would love to hear what you think of this soap after a few months - does having the fruit in the soap change it over time? I've never used a fruit puree in soaps before, but it seems like such a nice idea! 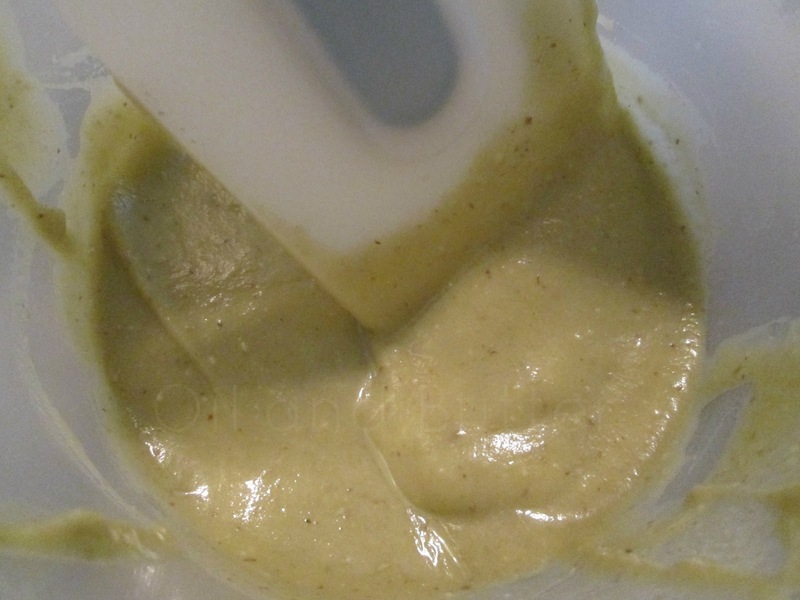 I think I should have blended my puree a bit smoother, I'm going to try another batch just to see. I'm really looking forward to trying this one, should be nice to use in the winter months! Beautiful soap Cee...I think I'll try this recipe for myself, I fit the mature skin catagory LOL! Got my soaps in the mail today and I LOVE THEM!! Thank you for the extras, they are amazing and smell wonderful! That was fast Gloria, I'm so glad! I figured you deserved extras for forfeiting the book...I hope you enjoy them! Thanks Kalla! You know I can't resist the embeds...lol! They look so beautiful, Christine! And so cute with those leaf embeds, just perfect for autumn! Beautiful soap, Cee! I love those cute little leaf embeds. 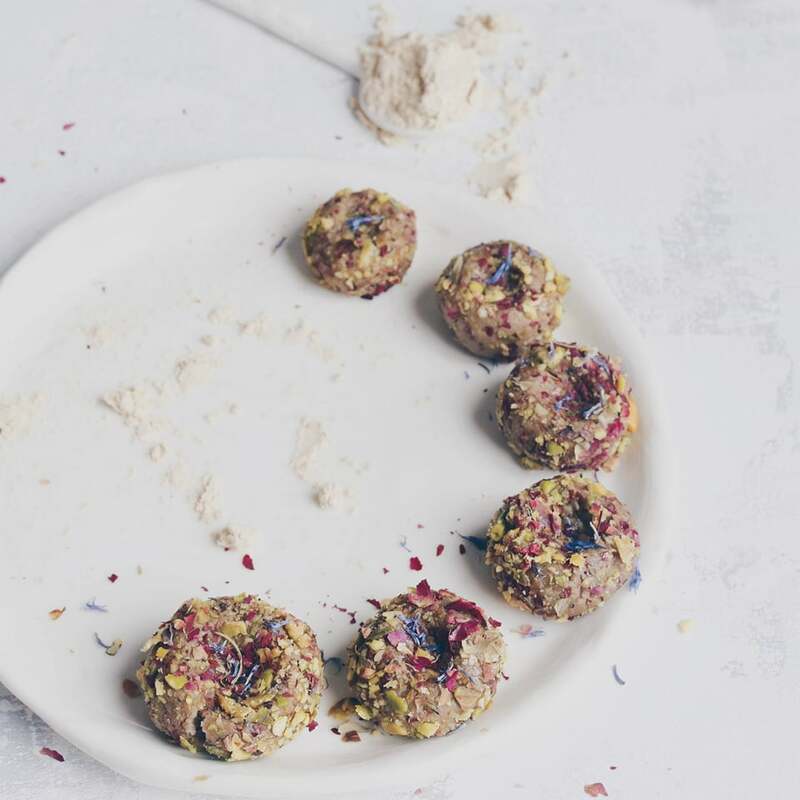 I'll bet these bars will be amazing with all of those avocado ingredients! Thanks so much Jenny, I can't wait to try this one out! So rich and white and such a beautiful photo (the last one). You just forgot to watermark it! It's so beautiful,so you better do so! Oooh,true, I saw it when I magnified the picture, but it's sooooo faint. Black would be more distinct,I think! Hey, cee cee. 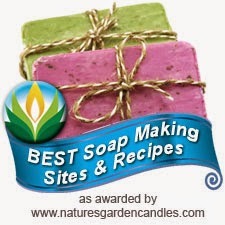 I love your soaps and was wondering do you ever sell them? If so, how could I buy them? Thanks. Hi Josh, thanks so much for your nice comment. I do have limited quantities of most of the recent soaps. If you send me an email through the above link on the left side of the page, I can then give you a better idea of the soaps I have available at present, thanks! Thank you Anne-Marie, and thank you for the wonderful inspiration in your book! So cute as always! Don't know where you find those molds but they're working out beautifully! It was very flattering and not just a little of a surprise to have my name mentioned in your blog. I wondered sometimes if anyone ever reads my blog, so now I know. Thanks for the mention! I'll be returning the favor when you least expect it. Another fab creation. Dunno if i'm brave enuff to try and make some myself. Would love avocado soap as i have dry/sensitive skin which is prone to rashes and eczema.. Well, maybe someday.. 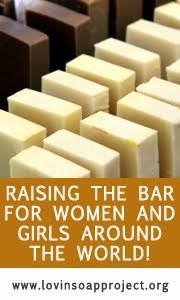 I am still reading a lot about soap, and it seems to me that some people think gel is great and others don't. Can you please explain to me why you didn't want this soap to gel? Also, how did the color hold up? How were the bars after curing? Thanks for answering. Hi RL - in her book, Anne-Marie advises not gelling this particular soap, because the heat from the gel might turn the fresh avocado brown. As you have read, gelling or not gelling is completely personal preference, there are pros and cons to both. I find that there are some soaps that I like to gel and others times that I prefer not to gel. I prefer the softer, creamier appearance that I get from not gelling, but I do find that my soaps are easier to cut (and I can cut them quicker) when they have gelled. So, it really depends on which soap I am making as to whether I will encourage gel or try to avoid it. The bars held up wonderful and retained their off-white color. Everyone who used them, loved them!